Is air conditioning repair the best option for your Denver home? Call us to find out! Do you have those noisy and cumbersome fans taking up floor space around your Denver, North Carolina home because you just can’t seem to get your HVAC system to give you the comfort you desire? Have you been putting off calling for air conditioning repair because you fear you’ll be told you need a new unit instead? We can’t say that our professionals at Cool Comfort Heating & Air won’t suggest that if your air conditioning repair is extensive or your unit is so old that it is actually costing you more in utility costs than a payment on a new one would be, but you can count on us for an honest assessment and no pressure. We aren’t there to upsell you. We’re there to perform the air conditioning repair you want and give you advice if you desire it. 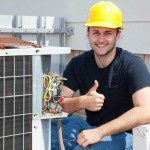 We are actually rather proud that our 25+ years of experience in the industry allows us to provide effective air conditioning repair when others say it can’t be done. We are great at keeping older systems working. In fact, we can repair any make or model, and our trucks are sent out well-stocked to handle the majority of repairs with just one visit. We offer appointments for air conditioning repair throughout the week and over the weekend, including emergency hours when needed. When you need air conditioning repair that won’t be a high-pressure sales visit but will finally let you put those monstrous fans away, give us a call. You can count on us for integrity and quality work for all your air conditioning needs. At Cool Comfort Heating & Air, we provide high-quality air conditioning repair services in Mooresville, Huntersville, Cornelius, Denver, Troutman, and Davidson, North Carolina.